Lighten up . . . As the mercury is rising here in the south, we are happy to report that the heat appears to have heightened our designers' creative juices. As we know, crisp cotton and linen bed linens make the perfect bed companions in summer. Paired with softened hues or perhaps bold color, in geometric pattern and/or nature-inspired florals, lighter fabrics are capable of soothing the mind and inspiring many a restful nights' sleep. Beautiful and oh-so-comfortable bed linens rests superbly upon meticulously filled and stitched down and silk fillers. ...and that's why we continue to strive to make the finest down pillows, comforters and featherbeds along with our DEWOOLFSON signature duple silk bedding. 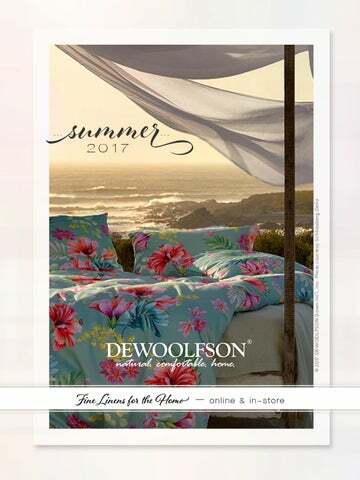 Click on any item within this look book to be taken to a coordinating page on our merchant website - dewoolfsonlinens.com - where you can find more information and place your order. Lighten up this Summer with us! We hope you'll enjoy our Summer look. Overscaled and vividly printed agapanthus blooms in a profusion of tropical hues. Includes top-of-the-bed and next-to-the-skin bedding. Corfu Bed Linens | STAMATTINA Calm and cool. Softened bands of watery hues trick one into believing the sea is mere footsteps away. In top-of-the-bed and next-to-the-skin items. Rivages Bed Linens | YVES DELORME Duvet cover and shams combine aqua-piped trim and linear, painterly, pink flowers on a white-on-white background. Fitted sheet and decorative pillow share alternating thin stripes of pink and aqua over white. Yves Delorme High Seas. Purity of line and color creates the atmosphere. Entrelecs' repeating motif borrows its subtle irregularities from handdrawn design and evokes the pleasure and ambianace of nautical luxuries. Architectural scale of designs are classic. © 2 017 DE WO OL F S ON D OW N I N T ’ L ., I NC .